You are playing in a multiple deck game where the option of soft doubling is allowed. The dealer has given himself a six, which is naturally a bad upcard. 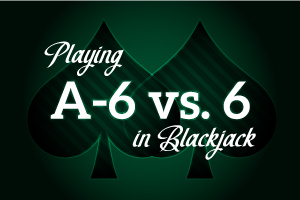 You're dealt an Ace and a six, which affords you a starting point where you have either 7 or 17, depending on what is more advantageous for you. You have the opportunity to double down on this soft hand. Should you do this, or should you hit the hand? By all means, double down, which means of course that you'll take one hit and one hit only. First, let's explain something - the win vs. loss results for you on this hand will be the same whether you double or hit. That's because if you're using proper Basic Strategy, you would never be taking more than one hit in this situation. Any ten-value card makes this a pat hand; an Ace, two, three, or four improves the hand, and anything else gives you a total on which you must stand against the six. That having been said, let's proceed to take a look at this hand. Either way, you go, you will win 52% of your hands while losing less than 40%. Quite obviously, you want to double here, because you'll take twice as much advantage of the situation. Of course, if you had a situation where you were to get the same win/loss results either way, and those results were negative, you'd rather hit than put double the amount of money on the table.